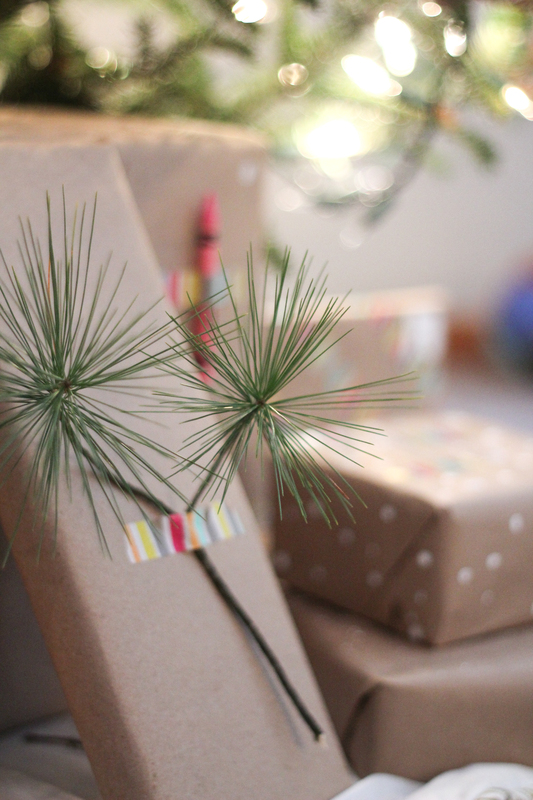 Does anyone else have the itch to switch it up each year when it comes to Christmas styles? I seem to fall in love with one color scheme or style and then I see the new line that comes out the next year and I fall in love all over again. This year I decided to take what I had and just mix it up a bit. 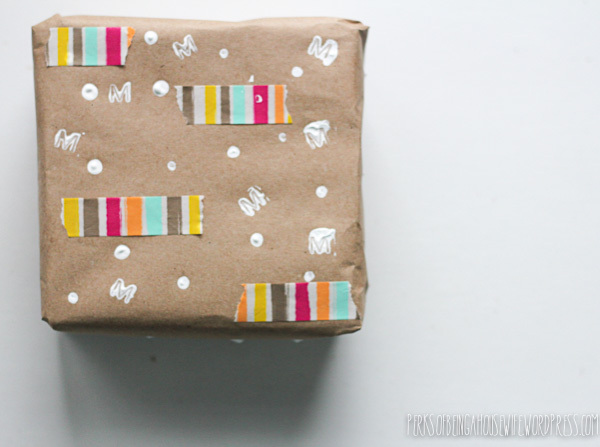 I wanted a more modern flair to certain parts of my decorating so I thought why not do so with my wrapping. 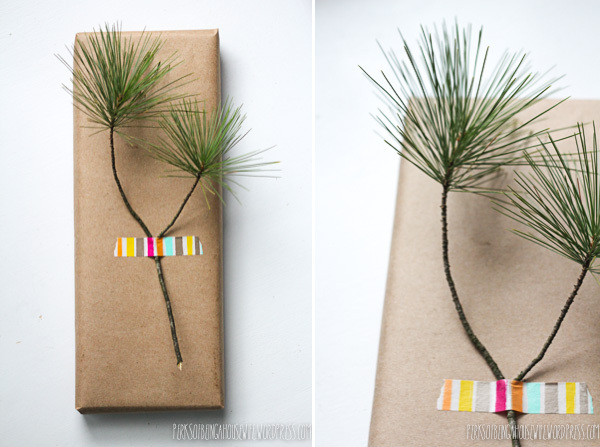 I love when you look under a tree and there’s a theme to the wrapped gifts. Maybe it’s silly or maybe it’s chic. 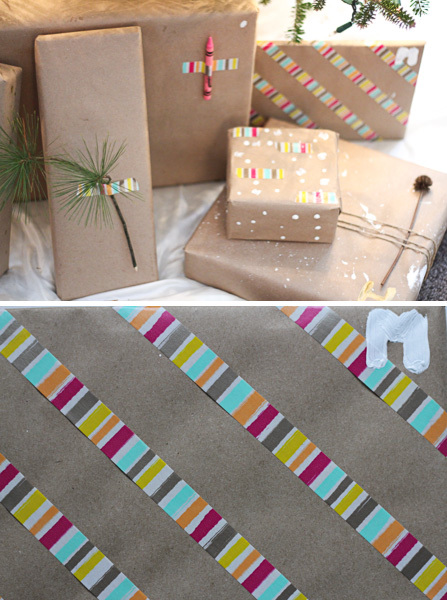 Either way, I just got out some paint supplies and purchased some kraft paper and a roll of washi tape to create my simple & modern gift wrap this year. Check it out! -Natural sprigs found outside. I used Pine and bee balm that I found in my yard. 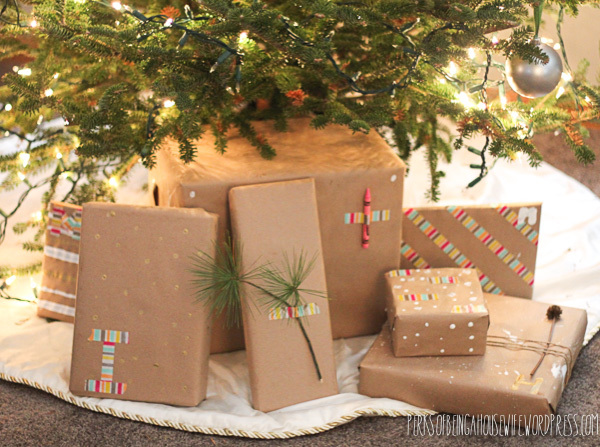 Wrap your gifts with the kraft paper. 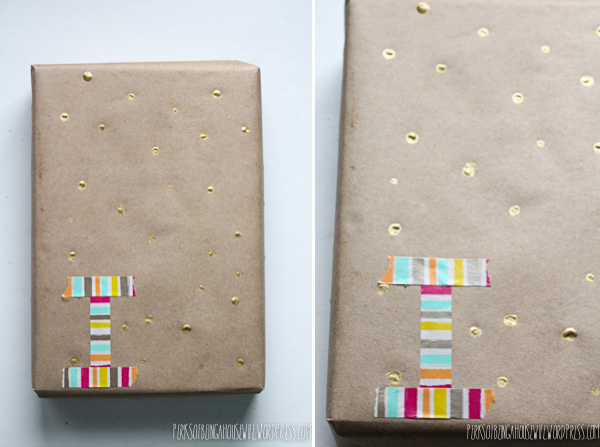 I found mine at Target in the scrapbooking aisle along with the washi tape. 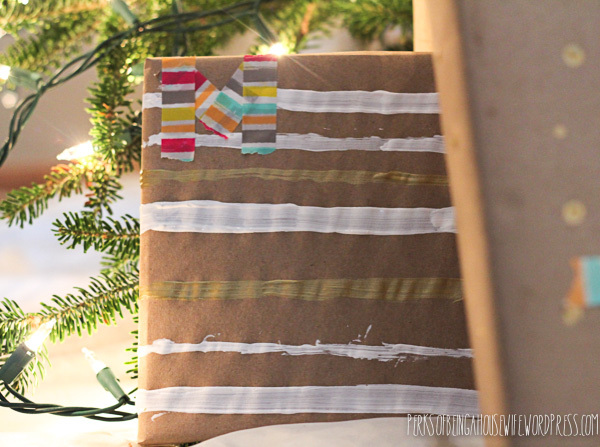 Mix patterns with paint and washi tape. 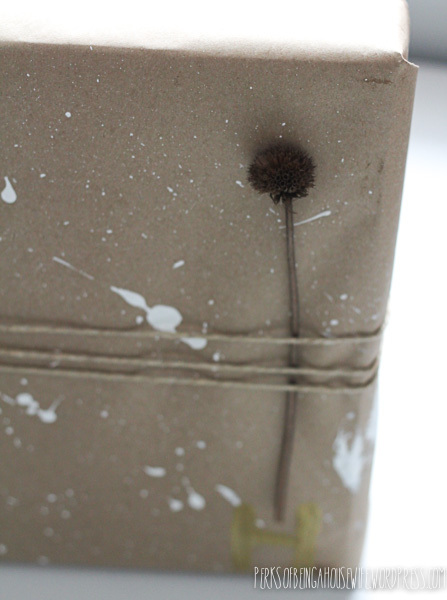 I just used the end of my paint brush to create the gold dots. 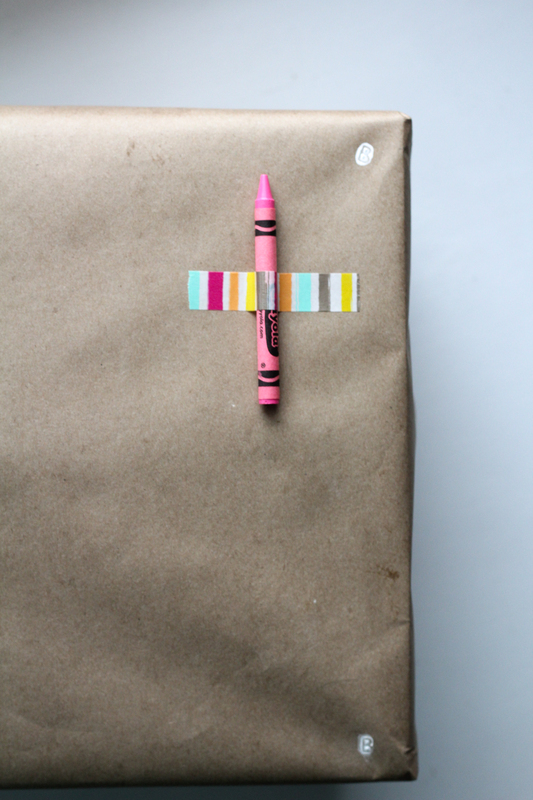 Attach a single crayon to the plain wrap for the littles so they can get creative while they wait for everyone to open gifts. 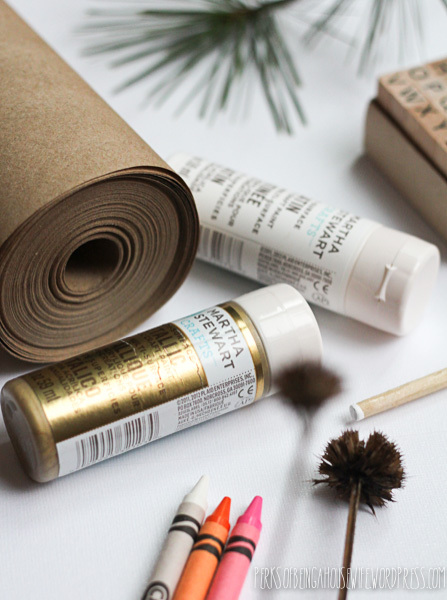 Add natural elements by attaching with washi tape or wrapped twine. 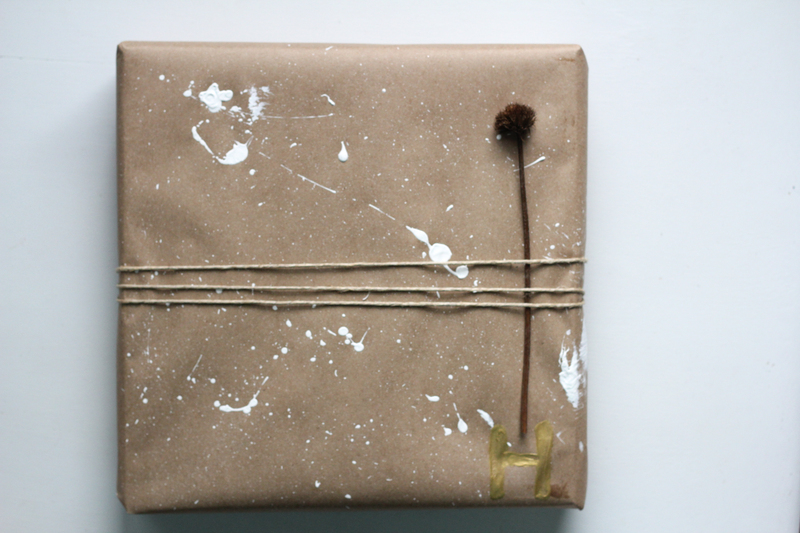 I just took a paint brush with paint and splattered it on the wrapping. For whatever reason this makes me think of the 90’s a little bit! Remember when splattered paint was cool? I initialed the package in gold so I knew who’s gift it was for. 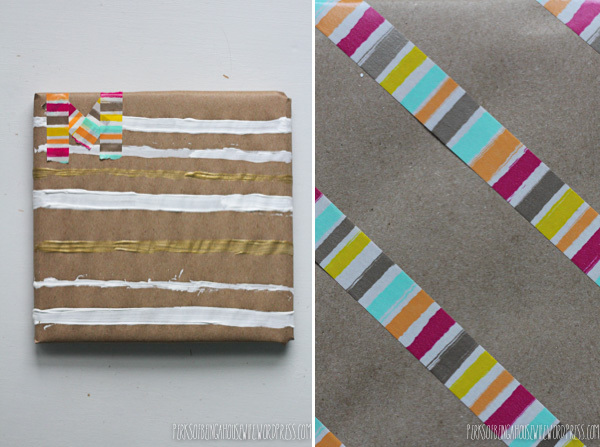 I love how bright and refreshing the washi tape is. Again, there’s no right or wrong way to dress up your wrap. GO FOR IT! 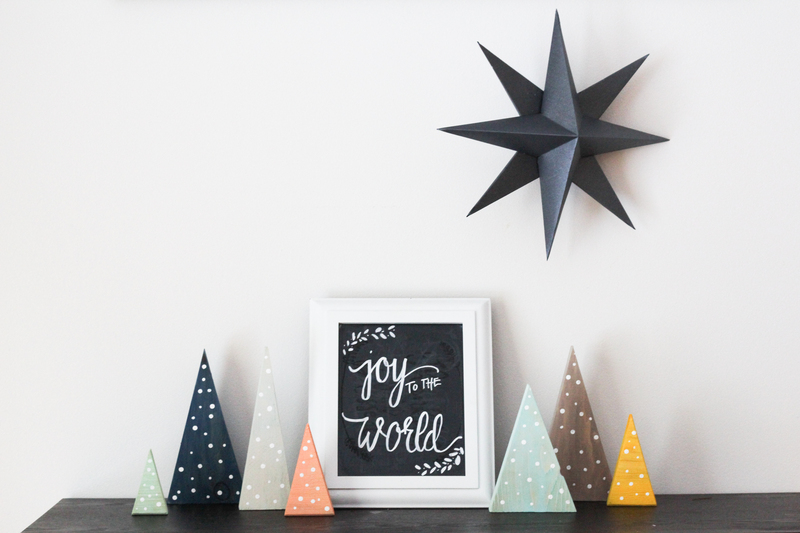 So simple and yet so fun and cheery. 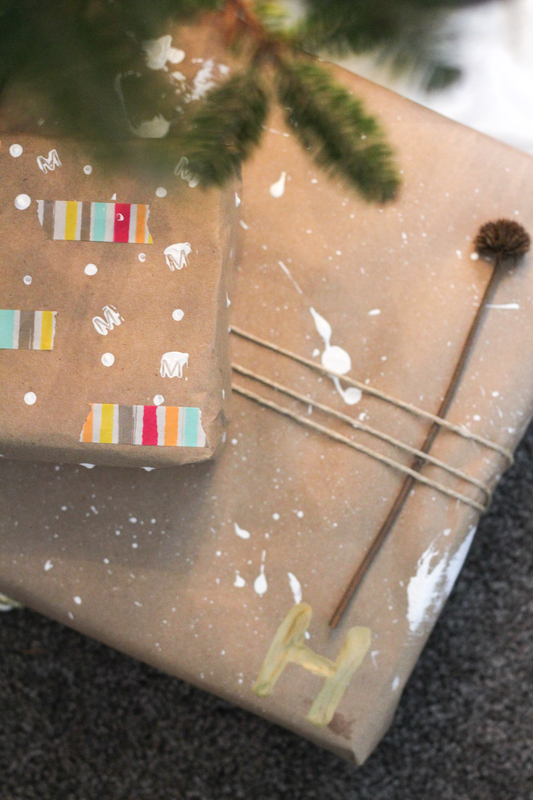 Have you got your presents wrapped yet? If not, here’s a modern twist we think you could try. 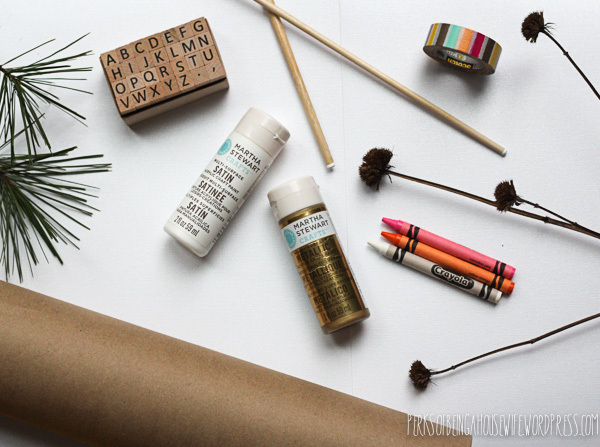 It’s so easy that even the littles could help with your creations which makes this a fun family Christmas project. And who doesn’t love to sit down with a cup of hot cocoa and do something as a family this time of year? 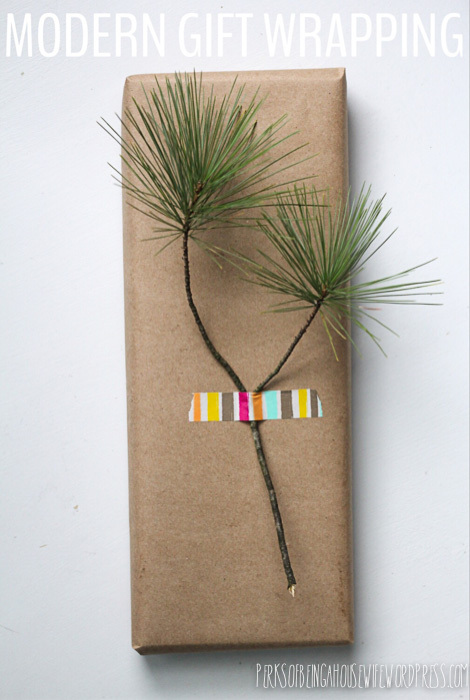 Happy wrapping! 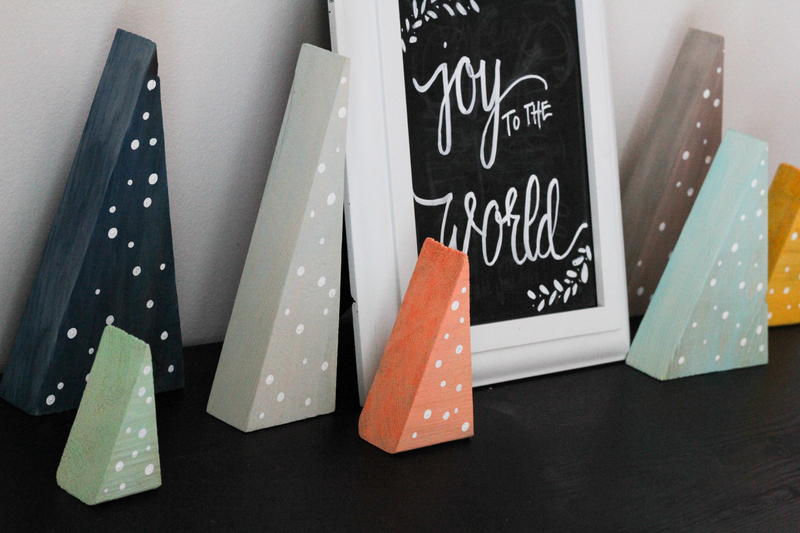 Here’s a little sneak peek at my other modern DIY Christmas/winter decor this year. Aren’t those little trees just to die for? Special thanks to my father-in-law for cutting the wood for my little modern winter forest. 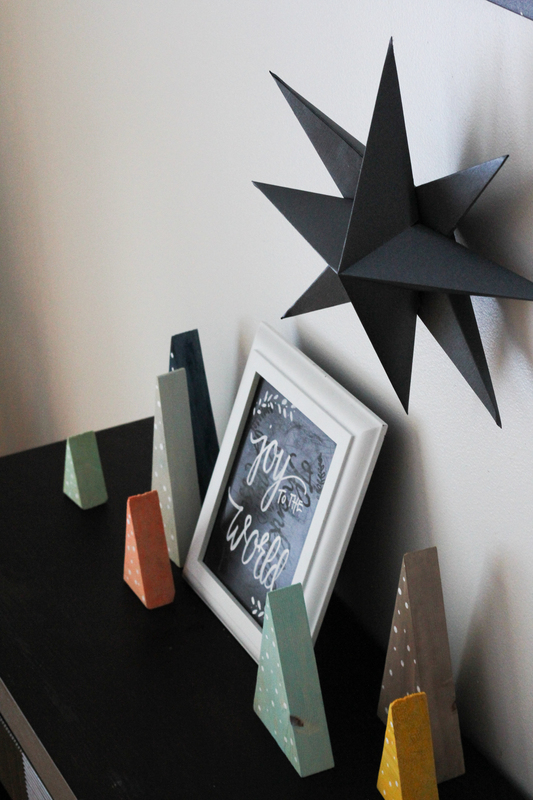 Everything is handmade including the star. Anyone feel a future blog post in the making? I think so! XOXO.